GTL’s DNA Maternity Test is a premium home DNA test at a low price. This maternity test establishes the probability that a female is the true biological mother of a child. Our Maternity test is offered at £99 and includes testing of the alleged mother, child and father. Maternity test results are extremely accurate – if the tested mother is the biological mother, the results will show a probability of maternity of 99.99%. If the tested mother is not the biological mother, the results will show a probability of maternity of 0%. Note: We can only guarantee standard result turnaround time when testing takes place solely using mouth swab samples. Using a discreet sample for your test may lead to an increase in turnaround time. Sample collection is by means of a DNA testing kit. We send the kit out to your chosen address once you have placed your order. The kit contains mouth swabs, consent forms and instructions. DNA samples are collected in just a few seconds following the step by step instructions we provide. The kit also contains a self-addressed envelope for the return of samples. Should you find you are unable to provide a mouth swab sample, we are able to extract DNA from a variety of other sources at additional cost. These alternate sources include hair, nail clippings, chewing gum, cigarette butts and clothing. 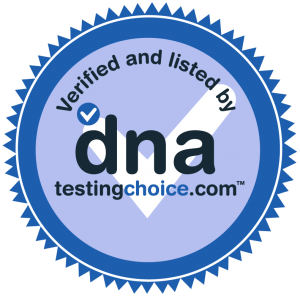 Please click here for full details of other DNA sources we can work with, prices and success rates. If you need your maternity test results to stand in court, you can opt for our legal maternity test. Our laboratory processing cost for legal maternity testing is £289 and includes DNA testing of the alleged mother, child and father. Additional children may be tested at an extra cost of £119 each. *Why so cheap? Click here to find out more about our cheap maternity tests.